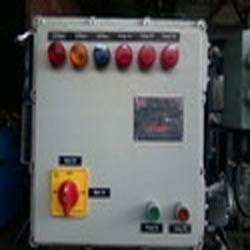 We have complete allegiance in manufacturing and supplying highly demanded Flameproof Pump Controller. We are developing optimum quality assemblies featuring robust protection in explosive environments. Widely utilized at varied power control centers and junction boxes the offered controllers are designed with IP66 compliant components and LM6 aluminum alloy. Further, our prestigious clients can order these high performing panels in application specific mounting fittings at a nominal price.